In the garden you see a sunbeam bounce off iridescent feathers, reflecting color as brilliant as any gem in a Harry Winston window. You blink, and there is a flash of emerald, a flurry of wings making the faintest hum. This thumb-size jewel pauses in the air defying gravity, and then plunges head first half disappearing in a flower. It comes back out covered with pollen and quite content. What is it? A tiny bird, an insect, a figment of your imagination? �They're a bridge between the insect and bird worlds,� says Doug Altshuler, an Assistant Professor of Biology at the University of California - Riverside, who studies hummingbird flight, observing that their wing muscles look more like an insect�s. �They're amazing little Frankensteins.� Hummingbirds have skeletal and flight muscle adaptations that allow the bird great agility in flight. Hummingbirds are sometimes called hummers, named for the sound made by their wings. With in the family Trochilidae, they are native only to the western hemisphere. There are over 330 species that thrive in very diverse environments, from southern Alaska to the Caribbean, from the lowland forests of Brazil to the 15,000-foot snow line of the Andes. Nineteen species live in the Unites States with most migrating to warmer climates in the winter, even though they are able to tolerate temperatures below zero. The Bee Hummingbird (Mellisuga helenae) is the smallest bird in the world, weighing 0.06 ounces and measuring about 2 inches. A more typical species, the Rufous (Selasphorus rufus), weighs about 0.106 ounces and reaches a length of 3.5 to 4 inches. 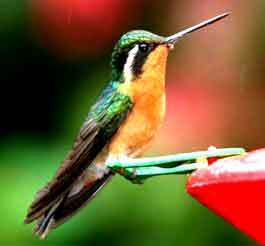 The largest is the Magnificent or Giant hummingbird (Patagona gigas), some weighing as much as 0.85 ounces and measuring 8.5 inches. Hummingbirds have the most glittering plumage in the bird world because of the metallic sheen of their feathers. The flat feathers on the lower throat are called gorgets (pronounced gore-jets) and are some of the most specialized of all bird feathers. Males use them in breeding displays and to threaten territory intruders. Gorgets also help identify the various species of hummingbirds. The females have a subtle coloration, while most males display brilliant reds, oranges, greens and/or blues. Some have only an iridescent throat patch or cap. Others, such as the Coppery-headed Emerald, are entirely iridescent. Hummingbirds� wings hum or make a whirring sound when in flight, which is referred to as a �wing whistle.� The hummingbird�s elongated tapered beak is another of their characteristics from which an extendable, bifurcated tongue has evolved. Their tongue allows the birds to feed on nectar deep within flowers, which they consume at a rate of about 13 licks a second. The lower beak has the capability of flexing downward, creating a wider opening to capture insects in the mouth rather than at the tip of the beak The consequence of hummingbirds being more comfortable in flight is that their feet are poorly developed. If they want to move even a couple of inches, they must fly. Their feet are used for perching and grooming. They use their three front claws to comb their head and neck. There is an oil gland at the base of their tails and use this with their bill to groom their wings, abdomen, and tail feathers. Finally, they clean their bill from base to tip, using their claws and a nearby branch to wipe it clean. Hummingbirds like to bathe in a shallow pool of water, such as a cupped leaf. They ruffle their feathers, flutter their wings or pull them straight back, lift and spread their tail, then dip their chins and bellies into the water, sometimes throwing their head back to toss droplets on their backs; or they will just sit in the rain on a bare branch. Hummingbirds also like sunbaths, perching with their breasts towards the sun, fluffing out, and extending their neck and spreading their tail. Hummingbirds lack a true song but make a number of unmusical calls, from deep gutturals to high-pitched chirps but most are short buzzing trills and twitters. Hummingbirds vocalize to attract a mate and a few males will chatter loudly making a muttering, scratchy, sputtering noise to establish and protect a territory. With the exception of insects, hummingbirds (in flight) have the highest metabolism of all animals. Their heart rate can reach as high as 1,260 beats per minute. As most of their energy is spent flying, they must constantly feed, consuming more than their own weight in food. At night, their metabolism slows down to between 50 and 180 beats per minute and they enter a hibernation-like state known as torpor, reducing the need for food. Most living beings with rapid metabolisms have short life spans, but hummingbirds have lived as long as 17 years in captivity. In the wild, they survive from 5 to 7 years. Hummingbirds feed on nectar or tiny arthropods from flower blossoms, especially when feeding their young. In order to consume as much nourishment as they do, they must visit hundreds of flowers daily as they are only hours away from starving. Consequently, there is a strong interdependence between hummingbirds and their flowers. 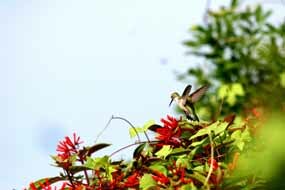 At least 150 North American plants (Upper Gulf Coast plants listed below) seem specialized for hummingbirds and these tend to bloom for a longer period of time. Typically, the flower is shaped in such a way that it can accommodate their whirring wings. The corolla (the overall structure of flower petals) tends to be thick enough to resist the beaks of other birds. Quite often these flowers are red, which is a color bees have difficulty seeing. Though once a hummingbird is attracted to a garden, they usually find other colored flowers equally tasty. 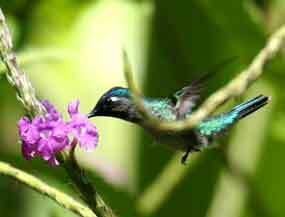 Considering insects use scent, and birds use sight, hummingbird flowers usually have little or no fragrance. 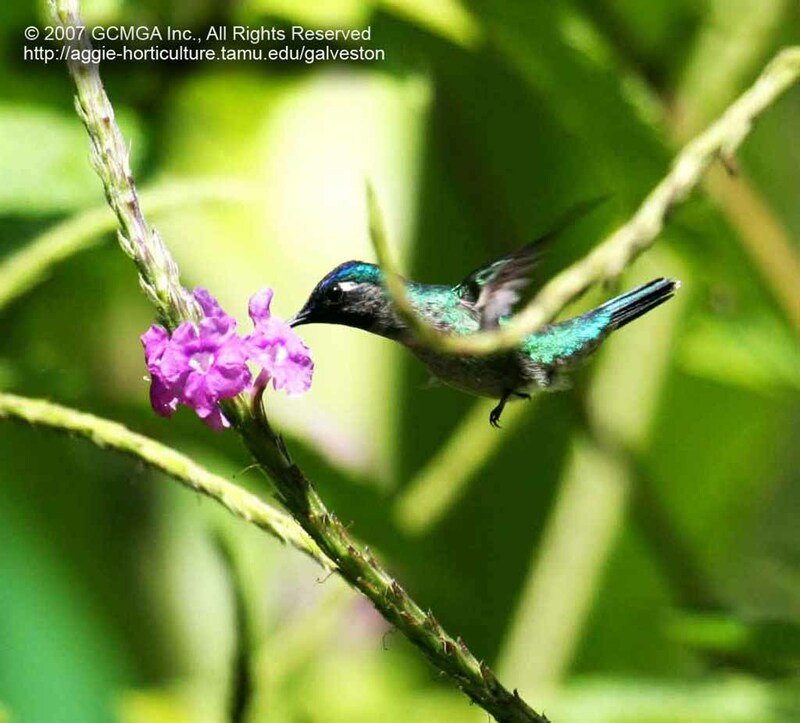 The hummingbird�s bill fits perfectly into the long, tube-shaped flowers of these plants. Some folks think hummingbirds have a hollow tongue like a straw, but their tongues actually have grooves on the sides that collect the nectar at the lowest point in the flower�s tube. Hummingbirds are important pollinators, for when they feed their forehead rubs against the stamens and pistils collecting pollen. They then move from flower to flower, pollinating as they go. Hummingbirds have quite good memories and will remember food sources from previous years. Not only can hummingbirds fly up to 60 miles per hour, they are renown for their aerial displays. Some are courtship and others are aggressive. They have long, blade-like wings that, unlike the wings of other birds, connect to the body only from the shoulder joint. This adaptation allows the wing to rotate almost 180̊ enabling the bird to fly not only forward but also straight up and down, right and left, backwards (this is the only group of birds able to do so), and upside down. While other birds get their flight power from the down stroke, only hummingbirds have strength on the up-stroke. Plus they can stop in midair by rapidly flapping their wings 15 to 80 times per second depending on the species. Patagona gigas is the exception, with 8 to10 wing beats per second. The wings of medium-sized hummingbirds flap about 20 to 25 beats per second and the smallest are 70 beats per second. Regardless, all a human sees is a blur. This ability allows the hummingbird to hover, maintaining their position by holding their bodies upright and flapping their wings horizontally in a shallow figure-8. The wings swing back and tilt flat for a moment before the wings are drawn, similar to a hawk moth. Oddly, this little bird is one of the toughest and most confrontational players in nature. �I think the hummingbird vocabulary is a hundred percent swear words,� says Sheri Williamson, a naturalist at the Southeastern Arizona Bird Observatory. Williamson believes their aggression stems from ferocious territorial instincts developed by their need for frequent nourishment. Hummingbirds compete for food by challenging and bullying each other. They guard their territories perching above nearby flowering bushes or feeders. An invader will dive bomb the sitting bird. The perched bird raises its head and holds out its wings and flies upwards. Face-to-face in midair, they pirouette, flap their wings against one another and jab with their long bills. Once they lock bills, they begin to spin and then dive to the ground creating a blur of color. When they hit bottom, their bills come apart and the hummers paddle backwards in a �dance of dominance� that ends as quickly as it begins. During these duels they use their bills and claws as weapons but are seldom harmed (though they may lose a few back feathers). Instinct tells the hummingbird not to risk damaging its valuable beak. Only males perform these dive displays. Females and immatures are more likely to do perched displays in which they spread their tail feathers to show the white tips. Yet hummingbirds communicate with one another by making other visual displays. Both males and females do shuttle-flights, which are rapid back and forth movements. During a shuttle flight, males raise the feathers bordering the gorget and toss their heads from side to side, while uttering shrill sounds. The shuttle dance of the male is usually part of a courtship ritual. Males arrive at the breeding area in spring and establish a territory before the females arrive. When the male finds a ready female, he entices her by flying in front of her in short rapid arcs, posturing. At key points during the dive, buzzing, whistling or popping sounds are made with the wing feathers or his vocal cords. Then he engages in a nuptial flight rising 8 to 10 feet above and 5 to 6 feet to each side of the female in large U-shaped patterns. If the female perches, she will look coy by moving her head back and forth watching his amazing moves. The male, beating his wings up to 200 times per second, then begins flying in rapid horizontal arcs less than 0.0115 inches in front of her. Next she hangs upside-down by her toes posturing with her tail feathers cocked and her wings drooped so he can mount her. In species south of the border, males gather in communities called leks, singing together trying to lure females to come to them for mating. Only mating on neutral ground, male and female hummingbirds establish separate territories. Hers is to build a nest and feed her young, his is to protect a reliable food source. If a female enters his territory, he does aerial displays to keep her away. As a rule, male hummingbirds do not contribute to the building of nests or caring for young. The female constructs a neatly woven cup shaped nest in a tree branch. Hummingbirds may repair and reuse the same nest, or build at the same location, right on top of the old one. Females produce 2, and sometimes 3, broods. When chicks hatch, they need protein to grow and the mother spends her time catching small insects and spiders for them. She feeds the nestlings 1 to 3 times an hour by regurgitation, perching on the side of the nest, arching her back, stretching her neck, lifting her head, and holding her bill as her throat swells. Then she pumps her beak, like a sewing needle, down her offsprings� throats, regurgitating half-digested insects. The nestling phase typically last from 14 to 31 days, varying with the availability of food; but18 to 23 days is the norm. Chicks are considerably larger than their mothers weighing about 0.1587 ounces at which time the female is down to only 0.0882 ounces. The young leave when they are 22 to 25 days old. She begins incubating the first egg as soon as it�s laid and that chick will hatch and fledge earlier than its sibling, but remains close to the nest until the other is ready to fly. Mothers continue feeding fledglings for another 10 days after they take flight. Little wonder people have been fascinated with these creatures for centuries. They provide endless sources of entertainment and education. If a hummingbird flies into your garage and becomes trapped, know that this is a life-threatening situation as they can become exhausted and die within an hour. If a trapped hummingbird is within reach, catch it gently (hummingbirds will lie quietly between cupped hands) and release the bird outside. Hummingbirds have been known to land on a soft-bristled broom if held up to them and they can be carried outside to fly away safely. Attracting hummingbirds is as easy as either planting certain flowers in your garden and/or putting up a hummingbird feeder along with a reliable water source such as a mister or dripper. The diet of hummingbirds requires both an energy source (nectar) and a protein source (small insects). A garden of hummingbird plants is the safest way to provide both. Select plants that have blooms throughout more than one season. Planting these near windows gives a good view of the marvelous birds. Hummingbirds will also take sustenance from artificial feeders. Feeders allow hummingbirds to be observed up-close while providing a reliable supply of nectar, especially when flower blossoms are less abundant. Homemade nectar can be made from four-parts boiled water to one-part white, granulated table sugar. The water should be boiled before measuring to ensure that the ratio of sugar to water remains 1 to 4. The cooled nectar is then poured into the feeder. Do not add any color or vitamins to the solution. Other things to avoid are honey or artificial sweeteners. Some commercial hummingbird foods contain red dyes and preservatives, which could be dangerous to the birds. Prepared nectar can be refrigerated for 1 to 2 weeks, but once placed outdoors it only remains fresh for 2 to 4 days in hot weather, and no more than 5 days in moderate weather. If the feeder is in a shady area the solution may last a little longer without spoiling. Buy a hummingbird feeder that is easy to refill and keep clean. When changing solution, rinse the feeder thoroughly with warm tap water, flushing the reservoir and ports to remove build-up. Dish soap may be used, but always give the parts an extra rinse so there is no residue left. If mold appears, soak the feeders in diluted chlorine bleach and rinse thoroughly with clear water. Other animals are attracted to hummingbird feeders so it is a good idea to get a feeder that has narrow ports with a mesh-like guard to prevent bees and wasps from getting trapped inside. If ants get into a feeder, an �ant moat� can be purchased at specialty garden stores or online, or try placing vaseline on the feeder�s pole to trap ants. If a larger hummingbird drives a smaller one from a feeder put out a second feeder that contains a slightly lower sugar concentration. Hummingbirds instinctively know a feeding source that is denser in sugar, and a more aggressive bird will make that feeder its own. Smaller species will then flock to the second feeder. It is true that red and other bright colors initially attract hummingbirds, so paint the pole red or tie some red ribbons on it. A small number of species may appear from late August through January. Since natural food sources for these birds are non-existent in sub-freezing weather, feeders can contribute greatly to their survival. Always keep the feeder clean and the syrup fresh in the same as summer. A 4:1 syrup mix will start to freeze below 27degree F, but a 30-watt PAR-series flood lamp in a clamp-on reflector (commonly sold as work lights) will extend that to near zero. Keep the lamp at least a few feet from the feeder. Just remember that hosting a winter hummingbird implies a commitment for the duration of its stay. Beneficials in the Garden & Landscape is an Earth-KindTM program coordinated through Extension Horticulture at Texas A&M University. 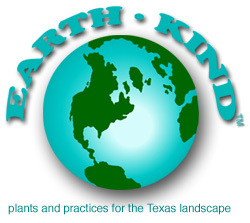 Earth-Kind uses research-proven techniques to provide maximum gardening and landscape enjoyment while preserving and protecting our environment. This web site is maintained by Master Gardener Laura Bellmore, under the direction of William M. Johnson, Ph.D., County Extension Agent-Horticulture & Master Gardener Program Coordinator. 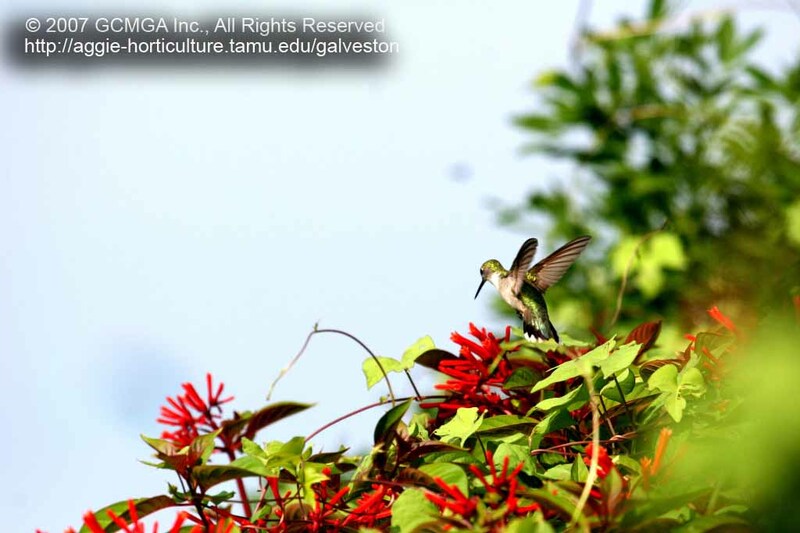 All digital photographs are the property of the Galveston County Master Gardener Association, Inc. (GCMGA) 2002-2015 GCMGA - All Rights Reserved.